So how do you make your pancakes? What's your favourite topping...? Sorry, in my pancake day excited frenzy I'm going backwards!! Let's rewind. Today is pancake day or Shrove Tuesday. It marks the start of Lent. Admittedly we have pancakes weekly in the B house but today marks an opportunity for an extra naughty topping or two! Biggest Baby B loves pancakes. They are such a great family breakfast or brunch and extremely cheap. Great if you have house guests. Today Baby B has had his normal raisin pancakes with banana but with a bit if chocolate spread and some cream. He couldn't believe his luck. I opted for some lemon and sugar. Simplicity at its best. Just throw it it the jug (or bowl) and whisk it till you have a thick smooth mixture. 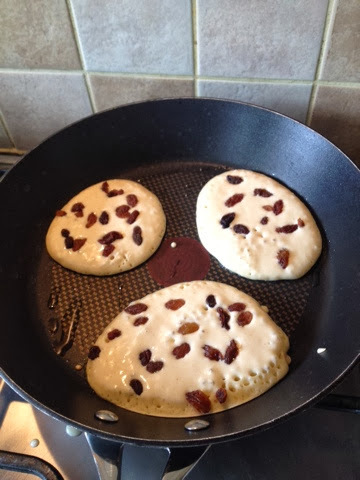 I spoon one tablespoon for each pancake onto a hot non stick pan sprinkling raisins on the top. (I used a tiny bit of butter today...naughty :-) ) Once little bubbles start to appear flip them over to cook the other side for a couple of minutes. Keep the pan on a consistent low-medium heat. Once your happy they are golden coloured and cooked, flip them out onto your plate. Then comes the fun bit. Toppings!!! We're not gourmet. Sugar and lemon. Banana and honey or chocolate spread. Blueberries and Greek yoghurt. I think my days of jam and cream are behind me. I know you all have your favourite toppings so share them with us? 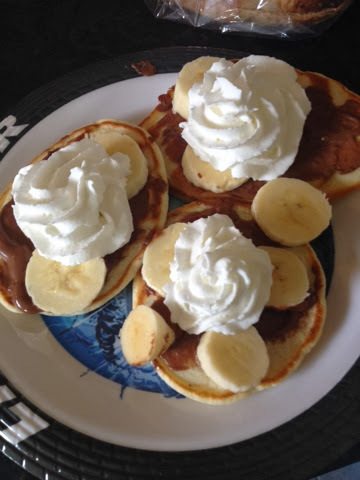 What do love to have on your pancakes? What is the best pancake batter recipe?